​​In the YAV house in Tucson there is a long, long dining table. This table started life as a communion table at Ghost Ranch, and was rescued and repurposed in 2012 to give a big group of volunteers a place to gather to share meals. YAVs that year, and in the years since, gather to eat at this grand, long table. I love to think about this retired communion table given new life, and the image of YAVs eating every meal at a communion table. Whether they're eating chicken or tofu, every meal becomes a kind of sacrament. YAVs pray together, laugh together, argue with each other and tell each other stories -- and all of this intentional fellowship reflects the resurrection in the beloved community to which God calls us. These holy moments are part of the bigger experience of being a YAV. The communion I see in every meal extends to the sack lunches YAVs eat at picnic tables and in staff break rooms in the places they serve. The body of Christ is represented in two peanut butter sandwiches eaten in a dusty yard, on the job with Community Home Repair Projects of Arizona. The cup of God's love can be seen in a cup of coffee shared with the roasters at Cafe Justo in Agua Prieta, Mexico. 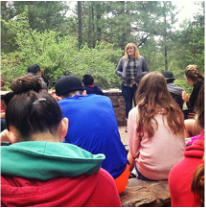 Tucson YAVs learn that the bounty of the resurrection thrives even in the desert. Volunteers bike around town, taking advantage of bike lanes and good weather, remembering that for some of our neighbors, cars are not an option. We read books together and explore new ideas that will shape our lives for years to come. All of Tucson celebrates the rain (when it comes), and YAVs quickly learn to rush outside when thunder rolls. Volunteers discover ways to have fun together while living simply, ways to share meals that taste like wine and bread even when they’re really made of brown rice and horchata. Communion celebrates a time when Jesus sat down at a table to eat a meal with his friends. Jesus sat down with people he taught and traveled with, people he worked with, people he argued with and loved anyway, with his community. Sound familiar? The YAV year is a year of your life you're choosing to spend in a different way. You're pulling up to a different table, set with new kinds of food, surrounded by new people. It’s not easy, but it is full and rich. Want to find out more? Send me an email or give me a call. I’d love to talk with you about what you’re seeking from this experience, and about the kinds of life you might find at this table in Tucson. Pull up a chair -- we're saving you a seat. The body of Christ is represented in two peanut butter sandwiches eaten in a dusty yard, on the job with Community Home Repair Projects of Arizona. The cup of God's love can be seen in a cup of coffee shared with the roasters at Cafe Justo in Agua Prieta, Mexico. The Presbyterian Church (USA) Young Adult Volunteer Program provides an opportunity for young adults, age 19-30, to serve alongside local partners in communities around the world. YAVs respond to poverty, violence and injustice, sharing the gospel in word and deed. Volunteers practice simple living in intentional community, and explore spiritual growth, social justice, and vocational discernment throughout their year of service. The Tucson Borderlands site is open to any person of faith or good will who has a desire to walk in solidarity with our partners and experience the joys and challenges of life in a diverse community. ​The Tucson Borderlands site began in the spring of 2002, and has hosted more than 75 volunteers from across the United States, South Korea, and Mexico. Volunteers serve in Tucson or on the U.S. / Mexico border with the churches and non-profit agencies who are our community partners. Since 2002, YAVs have spent more than 91,720 hours in mission in Southern Arizona! Keep this program going strong: donate here! What's different about the Tucson site? Biking! Tucson YAVs use bicycles as their main mode of transportation. This keeps us close to our community, is better for the Earth, and helps us live simply (cars are expensive!). Not sure biking is for you? Let's talk -- we can figure out what will work. Binational Partnership! Tucson is only 70 miles from the U.S./Mexico border. Each year, some YAVs are placed with Frontera de Cristo, a binational border ministry of the PC(USA) that works in the Mexican town of Agua Prieta. This partnership means that YAVs in Tucson share community with people who are living and working in Mexico. We're the only national YAV site with this kind of international partnership. Bocational Discernment! (Okay, it's actually vocational discernment, but we have this "B" theme going...) YAVs in Tucson spend some of their community time each month in a facilitated vocational discernment session, learning spiritual practices and reflection tools for discernment. Tucson Borderlands YAVs are also connected with a discernment partner from the local community to offer another chance to reflect and be supported as an individual. Want to be a YAV? Know someone who wants to be a YAV?